Jenna Hartley is a doctoral student at NC State. She is collaborating with Kathryn Stevenson on a North Carolina Sea Grant project that examines the power of grade schoolers as environmental change-agents in their communities. 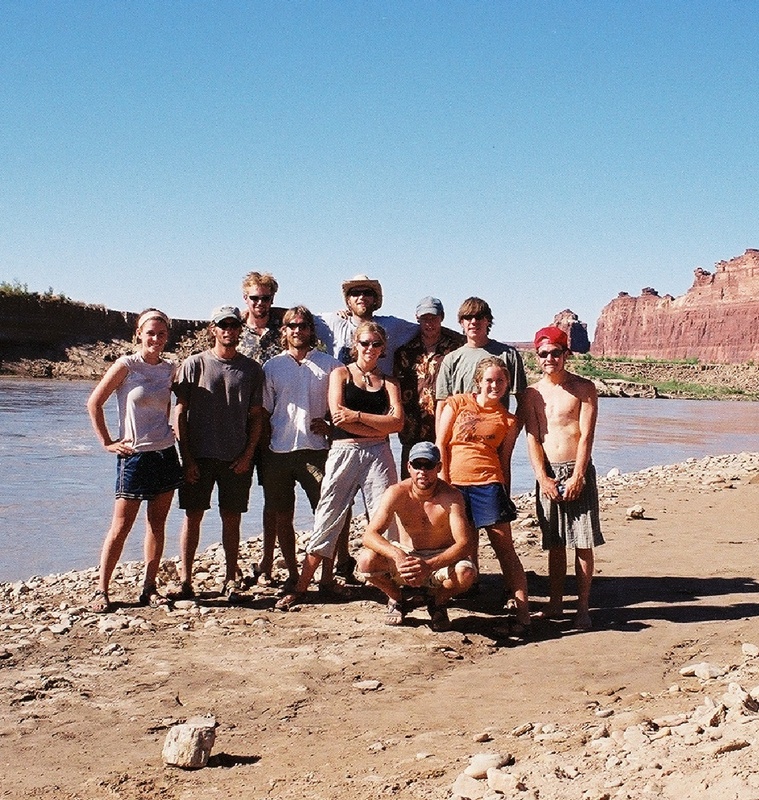 Jenna Hartley, in orange, on the banks of the Colorado with the research team during her seminal trip in college. Until very recently — as recently as the past 6 months — I’ve always looked at people that seem so established in their careers and the pursuit of their passions and wondered how they got there. This curiosity led me to watch countless TED Talks for inspiration and, admittedly, to attend more years of higher education than were probably necessary. But it was through those years of school, which I am very grateful to have had, that I realized that somewhere along the way I might just have stumbled into the pursuit of my passion. This could not ring more true for me. Last May, I accepted an award as the “STEM Volunteer of the Year” for the Research Triangle Park “STEM in the Park” Program, a nonprofit initiative that focuses on underrepresented minorities, girls and students from low-income backgrounds. The program facilitates hands-on mentoring and engagement opportunities with STEM professionals. As a student from what is now designated a Title I school in North Carolina, that award was so meaningful to me. The day before the event, I realized that it would be the first award that I had ever received that didn’t have to do with sports. At the time, I didn’t really see how that could be relevant, but then I realized this was exactly why it was relevant. As a kid, I was never into science. I cared about three things: my friends, my family and soccer. I made good enough grades, but I just didn’t think science was for me. I had classmates that made their own butterfly collections in second grade — and kids that knew they wanted to be doctors in fifth grade — and I just didn’t really feel like I was that kid. So, I assumed that science wasn’t for me. I went to college to do what I was “good at,” which, at the time was soccer and Spanish. But then I was lucky enough to have a roommate my freshman year named Shannon, and I’m so grateful that Shannon was — and still is — into science. She won a grant to do research in Colorado, and I went along and got the chance to help her sample an invasive plant species called tamarisk along the banks of the Colorado River. While there, I saw canyons for the first time in my life. 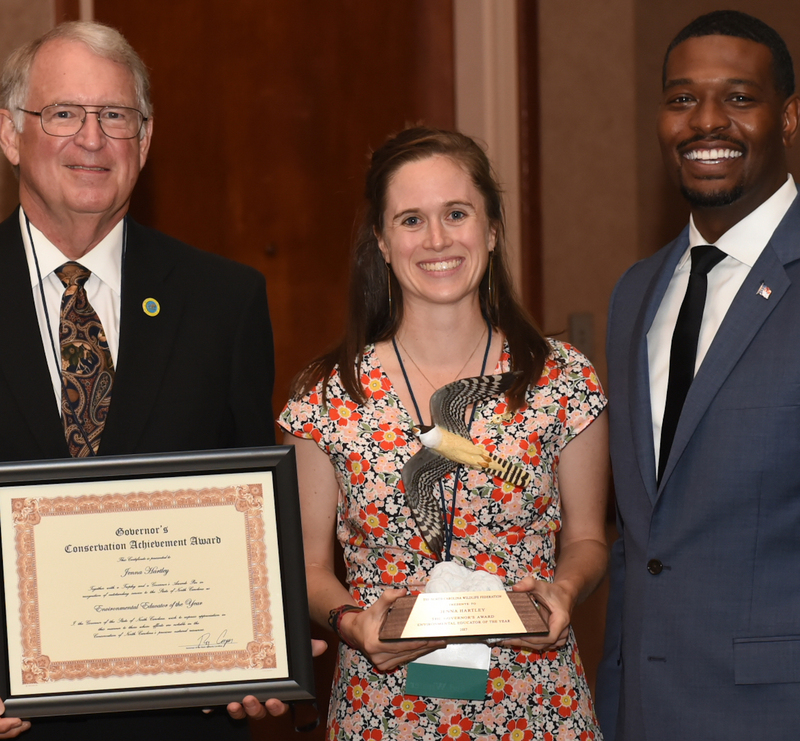 Jenna Hartley, receiving the Environmental Educator of the Year Award from Robert Brown, NCWF’s Immediate Past Chair of the Board (left), and Secretary Michael Regan of NCDEQ (right). Courtesy of the NC Wildlife Federation. I knew that I had to study whatever it was. It’s embarrassing now to admit, but I didn’t even know that geology was a thing, much less a science that I could study. I came back and declared my status as a geology major, having never even taken a geology class. I spoke with one of the heads of the department, who very easily could have looked at my transcript and laughed in my face. But he didn’t. He said, “You know, let’s do this, let’s make it happen.” He believed in me. Three years later, I graduated as a geology major and had conducted geology research in both Colorado and Puerto Rico. I had spent a summer at a geology field camp in Montana and Yellowstone and took one class that concluded with a trip to Hawai’i. I hardly recognized myself when I graduated. Literally, my entire life was changed by that one outdoor, scientific, environmental experience along the Colorado River. So, on a very deep level, I strongly believe in the power of pivotal scientific and environmental education experiences to change lives. Since then, I’ve dedicated my life to teaching science and to the further pursuit of scientific understanding. Now, in my role as a doctoral student at NC State, I’m thrilled to be working with Kathryn Stevenson to look at the power of students as environmental change-agents in their communities. This work combines my personal experiences, my career experience as a public school teacher, and my environmental passion. I’m delighted to be able to engage in environmental topics with teachers, students and communities across the state that I have always called home. While we aren’t able to take every kid to a canyon, I know that teachers, professors and community mentors can create valuable environmental education experiences for children that can absolutely change their lives. No matter what your role might be in your engagement with students, keep believing in them no matter who they are, no matter what their background is. I truly believe, from personal experience, that tangible, awe-inspiring moments of environmental science can change the lives of students who think, at best, they’ll only ever win awards for sports. 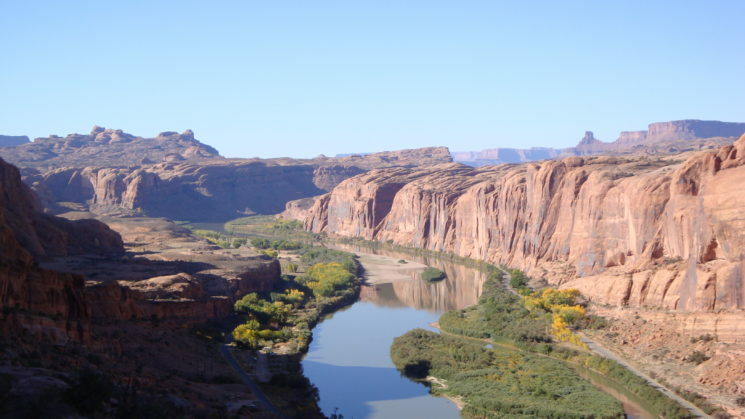 Lead photo: Colorado River from Moab Rim, courtesy of the USGS. « What’s in a Name? A Lot, It Seems!